Are you frustrated that you’re unable to generate adsense income from YouTube videos because you don’t meet the requirements of the YouTube partner program in the past 12 months of 4,000 watch hours and 1000 subscribers? Don’t worry because in the video below I’ll show you 7 ways how YouTubers make money without ads. You’ll not only make more money but you’ll make it faster! This is probably one of the popular ways to generate revenue from your YouTube channel without Adsense ads. Typically you signup for an affiliate program related to your niche and then you can make a 30%, 50% or more commission. Examples of affiliate programs you can sign up for are Amazon Associates, ClickBank, JVzoo, Walmart, etcetera. 2. Sell your own products and services. The beauty about selling your own products and services is that you make 100% commissions, the downside is that you have to create the product and all the marketing materials. Another great benefit of selling your own products is that you can get affiliates to promote your product. You also don’t need a ton of subscribers for your YouTube channel, for example, to sell a 100 page eBook called Tube Boot Camp, that’s a comprehensive YouTube marketing guide. I also sell a video ads course at mastervideoads.com. This is where you can offer one-on-one help for your expert services. If you have a skill or area of expertise, you can offer it to your viewers. You spend a lot of time creating, editing and optimizing videos as well as creating graphics for your YouTube thumbnails. You can offer video marketing services to local businesses by helping them set up a YouTube channel, creating videos and creating graphics for their thumbnails. For example, I sometimes create review videos for local businesses. 5. Brand deals and sponsorships. Brands often pay you to do a review about their product or service. They want to expose their product to your audience. For example, I did a review video for Videoblocks and got paid hundreds of dollars. This is where viewers might pay you in return for offering valuable content. An example of this service is Patreon. A good example of a person using this service is Peter Hollens. Here you can see his different tiered memberships. Five million videos are watched on YouTube every day so it gets a ton of traffic. By having a YouTube channel and creating lots of videos, you can siphon off that traffic to build an email list. The way to do this is to offer something for free in exchange for contact information, you can then send a series of email follow-up messages via order responder. You can then recommend your products and services that will offer solutions to their problems. Now you know 7ways how YouTubers make money without ads. Let me ask you an important question…how are you currently making money from your YouTube videos? Post your answer in the comments below. I’d love to read them and I’m sure others would too. Do you spend hours or days creating and publishing videos, then discover they’re nowhere to be found in the search engines? It can be very depressing when it feels like you wasted your time. In the video below you’ll discover how to make your YouTube video rank higher so it’ll appear on the first page of YouTube Search. Let’s look at a couple of examples of channels where the videos got first page rankings on YouTube. 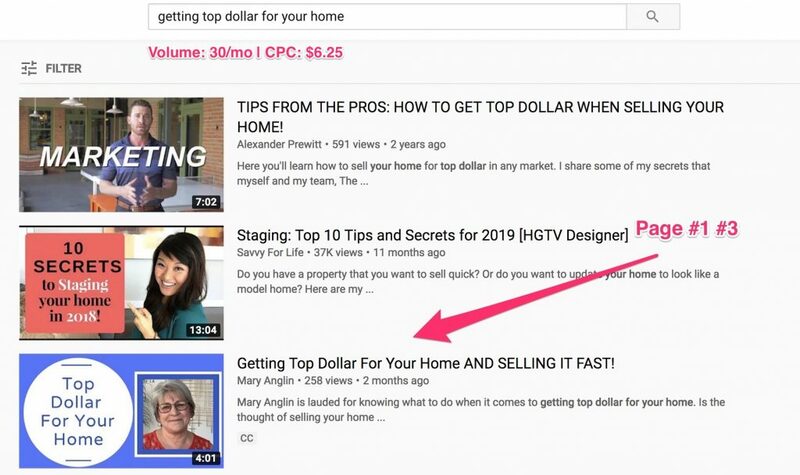 Here’s Mary Anglin’s real estate channel that got first page rankings for the term, “Getting top dollar for your home.” It currently receives a search volume of 30 searches per month, and a cost per click of $6.25 according to the free Chrome extension Keywords Everywhere. Clink here to watch my interview with Mary on how he she ranked her YouTube videos. Here are the 5 steps to make your YouTube video rank higher…. Identify the root keyword phrase you want to rank for. 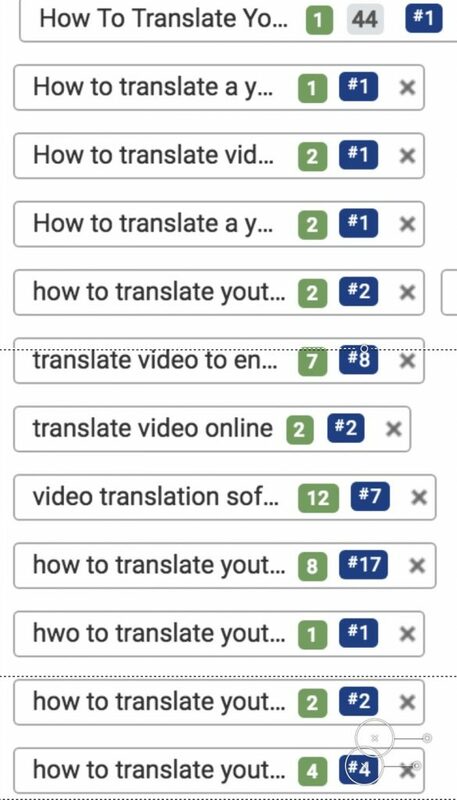 Here’s another example where I targeted the keyword phrase, “How to translate YouTube videos.” As you can see, it ranked for multiple keyword phrases. 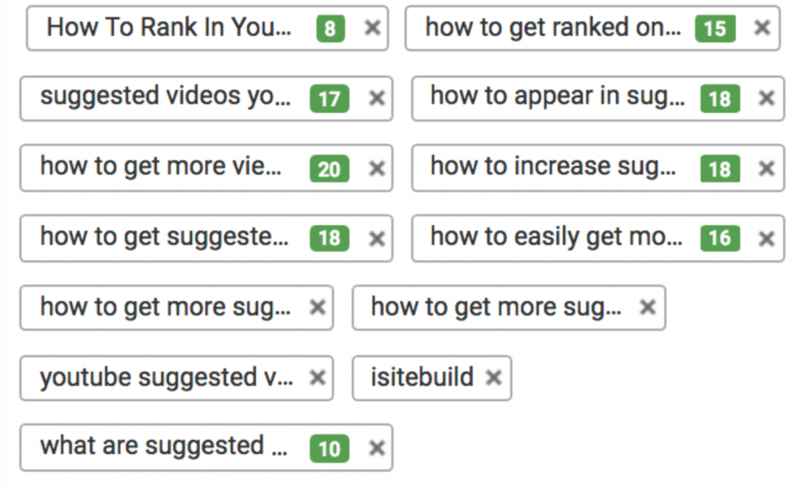 The root keyword phrase I targeted was, “How to translate YouTube videos,” which according to the Chrome extension Keywords Everywhere, gets a thousand searches per month. Some of the related keyword phrases include, “How to translate videos into English,” “How to translate a YouTube video into other language,” “Translate videos online,” etcetera. How do you quickly find these associated keyword phrases to rank for? I use the Keyword Planner tool in the free Chrome extension TubeBuddy. If you click on the Tube Buddy keyword explorer tool, and enter the main keyword phrase, “How to translate YouTube videos.” immediately it shows all suggestions as if I was typing the same phrase into the YouTube search box, click explore (see video). As you can see, the overall unweighted score is very poor. The unrated score refers to how good this keyword is to target based on the search volume and competition. Weighted refers to how good this keyword is to target for your specific channel based on search volume, competition, relevancy and how you compare to others currently ranking in search. 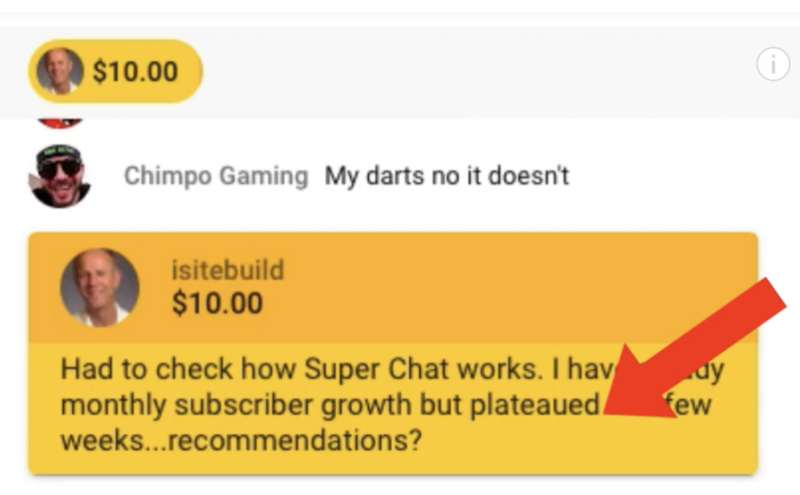 You need to upgrade to the pro license of TubeBuddy to get this feature. If I click on weighted I can see that the keyword score is still very bad. Let’s check an associated keyword phrase. Let’s try, “How to translate YouTube videos to English.” Immediately I can see that the weighted score is very good, 65 out of a 100. It says that the score above is specific to your channel based on how many views your videos tend to get, and your chances of ranking in these search results. It says that the search volume is moderate, the competition is very low, optimization strength very low, total number of search results is 3.34 million. If I click on the unweighted score it also says it’s very good, 54 out of a 100, so it’s not bad. I can also click on results. All right, one of my videos is already got the top rankings for that keyword phrase. I can also score down and check the competition. Here’s another one of mine. I can also check what’s trending by clicking on the trending tab. There’s nothing trending, so let’s look at the historical data. I can see there’s been quite a bit of traffic in the last few months. If I click on map I can see the regions where this video has been searched from, mostly it’s United States and India. The bit about this keyword explorer tool from TubeBuddy is that it can quickly find the keyword phrases that I wish to rank for, for future videos. I can create and rank new videos for these associated keyword phrases. It sure saves a lot of the time, and you can do it too. Make sure your videos are highly relevant. You want to place yourself in the mind of a viewer that are searching for a solution to the problem that they may have. Ideally, they want to find the most relevant information and YouTube wants to serve that relevant information to them. Therefore the more relevant the content of your video is, the higher probability it will rank on the first page of YouTube. Here are some tips to make your videos highly relevant. * Make sure your video content expands on the title that you’ve researched. * Make sure your video is engaging for your viewers by giving them the content that they wish to watch. * Say the actual title in your video. Ideally mention it at the beginning of your video then expand upon it throughout the video. * Create an eye-catching thumbnail. The thumbnail is going to be what wins the first click. If viewers don’t click on your thumbnail they’re not going to watch your video. * Craft a catchy title; add the keyword phrase that you researched in the title description and tags of your video. This will help satisfy the search engines. You might also want to add some extra words to your title to satisfy your viewer’s curiosity. For example when I wanted to target the keyword phrase, “YouTube brand account“, I title my video, “YouTube brand account versus personal”, which is best?” People are searching for the keyword phrase, “YouTube brand account” and “YouTube brand account versus personal.“. “Which is best?” adds some curiosity to the title. Add the title of your videos and associated keyword phrases in the description of your video. Do the same for your tags. Add your main keyword phrase to the first tag, then associated keyword phrases to the other tags. If you follow all these steps you’ll make your videos highly relevant to the search engines as well as to your viewers. After publishing your video, add it to an official playlist. YouTube will feature or recommend the videos and official playlist based upon the viewers browsing behavior. This is different to a regular playlist where YouTube doesn’t recommend the videos and net playlist. When you’ve added your videos to an official playlist make sure your link to that playlist and the cards and in-screens of your related videos. This will help viewers to binge watch your videos, and extend the watching time on the YouTube channel. 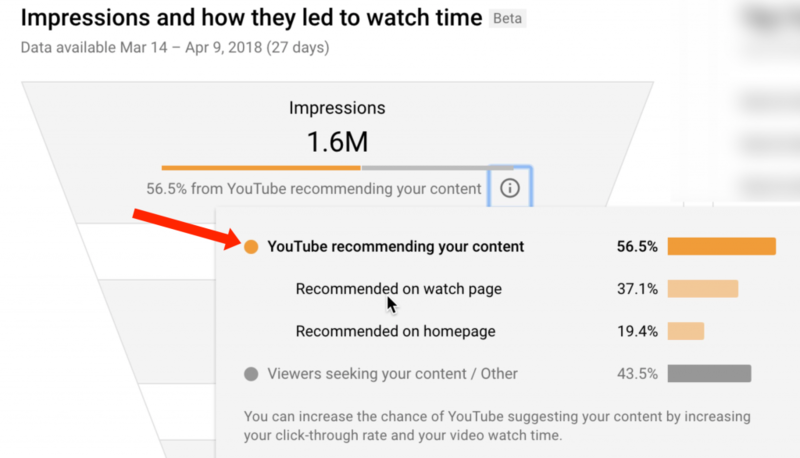 Since watch time is one of the main ranking factors in YouTube, your video have a high probability of also showing up in YouTube suggest videos. These are the videos that YouTube recommends on the right side of the video watch page. Do more of what works. When you notice that your videos get first-page ranking on YouTube and appears on the right side of a watch page, on the recommended videos create more of them. Instead of targeting the same keyword phrase, create videos based upon associating keyword phrases. If you follow this process you’ll rank for more keyword phrases on the first page of the YouTube search results. * Monitor your stats and YouTube analytics. * Go to your traffic sources report and see which videos are getting the most traffic. * Go to your subscriber’s report and see which videos are attracting the most subscribers. 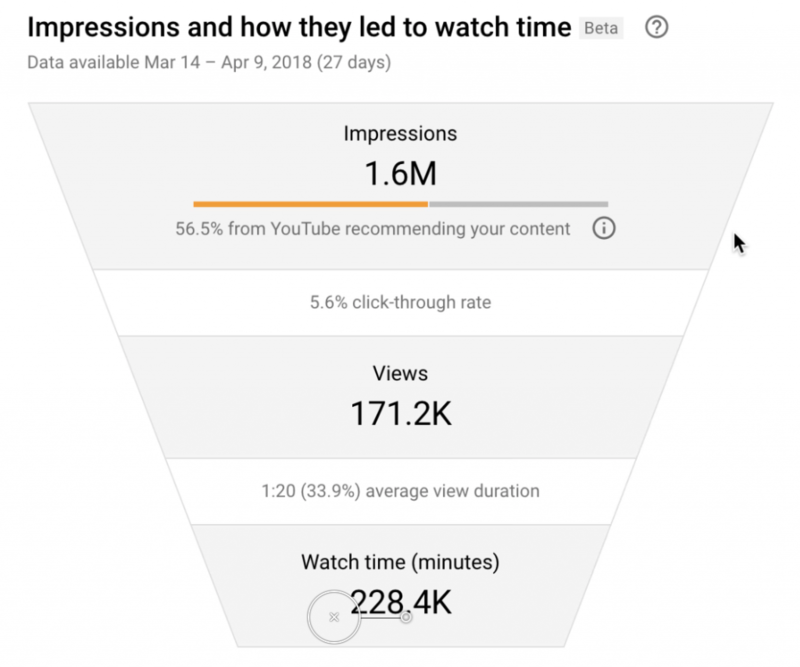 * Look for the videos that get the highest click-through rate, highest watch time, highest order into attention, and highest percentage of recommendations. If you do this you’ll quickly discover the videos that are performing the best on your channel.